Although he never topped the charts Billy Fury was one of the most successful singers of the era, and inspiration to many and a great performer. 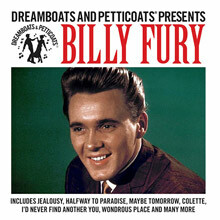 Either The 40th Anniversary Anthology or Dreamboats and Petticoats Presents Billy Fury are great places to begin exploring one of Britain's only genuine rock 'n' rollers. The teenager, born Ronald Wycherley in Liverpool in 1940, was given his name by the legendary manager, Larry Parnes. Larry 'the Beat Svengali' Parnes was an old fashioned manager of pop stars, he was dubbed 'Mr Parnes, Shillings and Pence' which gives you some idea of where Larry was coming from. Mr Parnes' theory of guaranteed stardom was simple; you needed the right sounding name. Unlike Americans, whose real names always sounded right, post war Britain suffered from a plethora of Rons, Toms, Johns and even a few Clives. In fact Larry's inspiration was Rock Hudson, which probably tells you something about Mr Parnes. Once a young hopeful was signed to Larry's 'stable of stars' he was quickly given a name that would look equally at home on a marquee or a Decca single. Among Parnes's protégés were John Askew aka Johnny Gentle, a singer the Beatles supported on tour, Richard Knellor also known as Dickie Pride, Thomas Hicks better known as Tommy Steele and Clive Powell who became better known as Georgie. In Billy's case Parnes wanted a name that conveyed the power of his singing and performance; he certainly managed that! 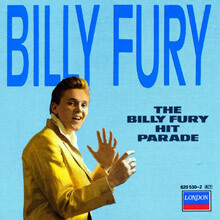 Fury went to a Marty Wilde gig in 1958 with the idea of giving him some songs that he had written to record. In the event he was pushed on stage by Mr Parnes, told to perform and was renamed ­– all in the space of an evening. He was naturally signed to a management deal and by February 1959 his first single was on the charts. It was only a modest success, as was the follow-up, but by early 1960 'Collette' had made the Top 10 and the music press was starting to write about the wild stage show that Fury had put together. Four more singles in 1960 all charted, although none of them higher than No.14, before his cover of 'Halfway to Paradise' made No.3 in May 1961. Over the next two years Billy Fury had 7 Top 10 hits including the brilliant 'Jealousy' which got to No.2 and the equally great, 'Like I've Never Been Gone' that reached No.3, as did 'When Will You Say I Love You'. 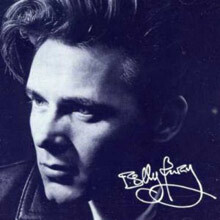 In 1960 he recorded his debut album, The Sound of Fury, which is one of the most exciting albums to come out of Britain in those pre-Beatle days – if you buy no other album from these heady days then buy Billy's. It features Joe Brown on guitar and is genuine British rock 'n' roll – a rare commodity. Georgie Fame was originally the keyboard player in Billy's backing band – the Blue Flames – but they were sacked by Parnes and after the Beatles were turned down for the job in late 1961, the Tornados became Billy's backing band. Billy's hits were more ballads than rock 'n' roll and if there is any criticism to level at him, it is that he sounded a bit too like Elvis for his own good. He began appearing in films but with the onset of the Beatles, Billy Fury's chart success waned somewhat, although almost every record made the Top 20 through the middle of 1965. By the late 1960s he was having heart problems and had surgery in 1970 and 1971. In 1973 he appeared in the film, That'll Be The Day with David Essex, but there was no return to the charts. More heart surgery followed and by the end of the 1970s he was declared bankrupt. An attempt at a comeback in 1981 was unsuccessful and in 1983 he died from his heart condition – he was 42 years old. One of Britain's only genuine rock 'n' rollers was gone too soon. 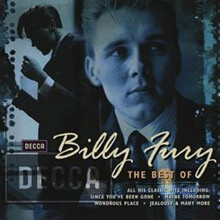 The idea behind this ultimately very persuasive two-CD, 63-song anthology is a good one, and short of a Billy Fury box set, it was probably the way to go, albeit with a few flaws -- the producers admit that they were unable to include any tracks off of what they describe as his most representative album, the live We Want Billy. All of the singles, however -- even the very attractive flop records -- are here, along with the better B-sides, which are augmented by album, EP, and movie tracks and four previously unissued songs from 1963 to 1966. All have been transferred from the original session tapes, which is the first stereo appearance of some songs, and the first CD appearance of the original mono versions of others. Even the softer pop-type numbers stay within a certain range of softer rock acceptability, and some of it is first-rate hard rock &amp; roll, on which Fury and the backing group the Four Jays sound like nothing less than Buddy Holly. His subsequent material, from the early '60s, does veer into teen-pop, though he's a good enough singer to keep most of it interesting amid the swirling strings and soaring female choruses. By the end of 1963, Fury was again toughening up his sound, getting bluesy, and trying to come to terms with the Liverpool sound embodied by the Beatles. Still, the record label found it easier to sell Fury as a pop/rock crooner, and the public found him easier to hear in that vein. 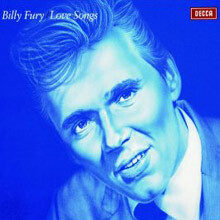 The second disc in this collection shows Fury trying to balance his repertory between that brand of pop/rock and blues. His last chart records of the 1960s show him stepping away completely from rock &amp; roll, although he still cut decent (and better than decent) tracks in a rock vein around them. The set closes with two very good ballads which were buried so deeply in the vaults that they didn't even have songwriting credits attached to them. 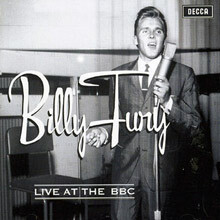 This collection of 41 tracks recorded between 1959 and 1970 features an amazing number of songs that Billy Fury recorded during his career for various BBC programmes. The sound quality/mastering is excellent considering the age of some of these tracks. From a raw ‘C’mon Everybody’ to Conway Twitty’s ‘It’s Only Make Believe’, all tracks from the first CD are taken from Brian Matthew’s Saturday Club with a collection of different backing bands including Georgie Fame among others. This collection of 26 of Billy’s chart hits plus 4 rare tracks (30 in total) released in 2011 celebrates the extremely successful 'Dreamboats and Petticoats’ musical of which Billy’s music is featured. Tracks include ‘Jealousy’, ‘It’s Only Make Believe’ and ‘Halfway to Paradise’. 20 tracks covering the highlights of his Decca years on this 2001 release. Tracks include ‘Halfway to Paradise’, ‘Like I’ve Never Been Gone’, ‘It’s Only Make Believe’ and ‘Colette.’ The remastered sound is outstanding. Billy's UK chart success began in 1959, but he was not the first pop star to emerge from Liverpool, as both Lita Roza and Michael Holliday preceded him. Although generally thought of as a rock and roller, there isn't much evidence of that here, most of the songs being upbeat ballads. He never had any chart success in America although his American record sales are said to have been healthy. He had more than twenty British chart hits – this compilation simply takes the twenty biggest and leaves out the others. In Britain, he is best remembered for Halfway to Paradise, a Goffin-King song that was an American hit for Tony Orlando at around the same time. Americans will also recognize Jealousy (a song that dates back to the 1920's but was a massive hit for Frankie Laine in 1951), It's only make believe (a top 10 UK hit despite Conway Twitty having topped the British charts with it only a few years earlier), Because of love (Elvis Presley) and I will, a song recorded by several American singers including Vic Dana and Skeeter Davis among others and which returned to the British charts in the seventies when covered by Ruby Winters. Billy originally wanted to be a songwriter and his first three chart entries, Maybe tomorrow, Colette and That's love, were all self-penned. I'd never find another you, Last night was made for love, Like I've never been gone, When will you say I love you and In summer were other original songs that were successful for Billy though not actually written by him. Billy's hottest period ran from 1961 to mid 1963, when his star faded as other Liverpool stars became more popular, but even the Beatles acknowledged the part that Billy played in putting Liverpool on the musical map. Billy is still regarded as an important early British hit-maker and his music may appeal to you if you like the music of Bobby Vee, Ricky Nelson, Buddy Holly and the Everly brothers. Born Ronald Wycherley in Liverpool, England Billy Fury was unquestionably among the most gifted of his generation in the early days of British rock & roll. At the time there were dozens of pretenders to the throne: Tommy Steele, Cliff Richard, and Marty Wilde to name a few. Sadly, chronic health problems would end his life before he would reach the age of 45. Fury's recording career began early in 1959 with "Maybe Tomorrow," a song that he wrote himself and which charted soon after its release. It's been said that he was perhaps the closest that England came to producing its own Elvis Presley. He was one of the very few English rock 'n rollers of the period who could hold his own alongside the likes of American R'n'R legends Eddie Cochran and Gene Vincent. The arrival of his fellow Liverpudlians, The Beatles, ended Fury's dominance of the teen music scene in England. Numerous reissues and releases of previously unreleased material by Fury have continued to appear in the compact disc era. This compilation provides a wonderful overview of a gifted artist that like so many, passed too soon. He deserves to be placed among the giants in the industry.